Elizabeth Campbell is Director of the United Nations Relief and Works Agency for Palestine Refugees’ Representative Office in Washington, D.C.
WASHINGTON DC, Mar 9 2018 (IPS) - As people across the globe marked International Women’s Day (IWD) on March 8, the safe and secure education and possibilities for the future of millions of young girls and women who are Palestinian refugees across the Middle East remained in danger. Unfortunately, a recent decision by the United States to significantly reduce expected financial support to the United Nations Relief and Works Agency for Palestine Refugees (UNRWA), has put at risk vital programs that advance gender equality and address gender-based violence. As part of its UN mandate to provide education, health care, relief and social services, microfinance, and emergency assistance to millions of refugees across Gaza and the West Bank, including East Jerusalem, Syria, Lebanon and Jordan, UNRWA educates 525,000 children in over 700 schools in the region. For decades, girls have represented half of UNRWA students. But with the salaries of over 30,000 teachers, health professionals, social workers and other vital UNRWA staff now under threat, the education of the next generation of women in the region is at risk, as is their hope for a more positive future. Palestinian refugee girls grow up in bleak conditions, often surrounded by poverty and violence, but their schools provide safe havens and the opportunity to dream about – and prepare for – independent futures, college, travel, careers, and families of their own. 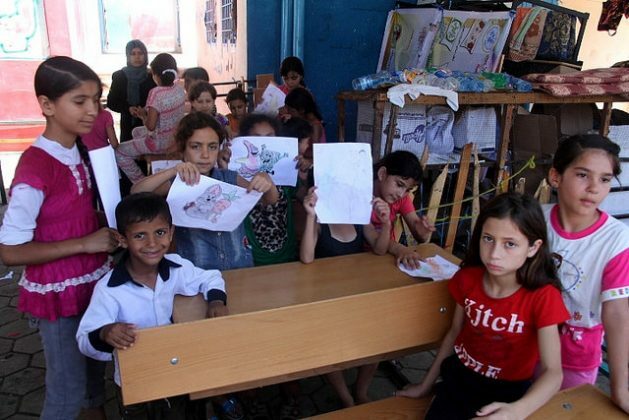 They rely on the security of UNRWA schools, which have proven to be among the highest performing in the region. Shahed, a 14-year-old Palestine refugee, was born and grew up in Yarmouk refugee camp in Damascus, Syria, a life that was happy until the war began. After losing her father and friends to the war, and her camp being bombed, her experience at an UNRWA school was her saving grace. “The world must continue to support us because education gives us hope and dignity,” she says. The U.S. government’s decision in January to reduce funding to UNRWA by 83 percent compared with last year came unexpectedly, and after budgets and planning to provide vital services had already been established for this year. The United States has been the largest single supporter of UNRWA’s apolitical, humanitarian mission for more than six decades, since it started operating. As a result of these detrimental cuts, only $60 million of the U.S.’ expected 2018 contribution of more than $360 million has been disbursed to the only UN agency dedicated to caring for Palestinian refugees. The agency operates outside politics and at the direction of the UN member states which have continuously renewed its mandate to provide life-saving and emergency services to a refugee population that has grown to five million – until a lasting solution to the conflict is achieved. Last month, more than 100 members of the House of Representatives co-signed a letter to President Trump, pressing him “to continue vital U.S. contributions” to UNRWA. The Middle East Institute produced a video describing why UNRWA matters – and how vital outside funding is. The funds sustain such programs as microfinance loans, which through $37 million in loans last year, helped more than 38,000 individuals support their small businesses. Khould Sameer Abu Farhana, a mother of six who lost her house in the 2014 Gaza conflict, had to start a new life baking sweets, a livelihood she built through an UNRWA loan. With the urgency of raising funds to preserve its critical services, UNRWA is reaching out to the world community for help through its #DignityIsPriceless and #GazaOnTheBrink campaigns. The foreign ministers of Jordan, Sweden and Egypt will host a ministerial meeting in Rome next week with the UN Secretary General to convene UN member states to collectively protect the rights and dignity of Palestinian refugees and address UNRWA’s financial shortfall. The freeze on funding jeopardizes UNRWA’s operations, affecting the lives of millions, many of whom are young women and girls who quite simply need UNRWA’s infrastructure to survive and succeed, and puts at risk the stability of a volatile region, as well as the security of Israel. It also sets a precedent for the United States’ legacy abroad as a global humanitarian leader that seeks to protect the most vulnerable. We ask that the U.S. government reconsider its decision and not leave Palestinian refugees behind.